Sketch from Ruben Fletcher’s blog of and “Art Party” at “Glen McClure’s downtown Norfolk studio.” Uploaded December 9, 2007. Glen McClure’s photo studio comes to life in downtown Norfolk, Virginia, this time of year. I always enjoy attending Glen’s annual print sale, seeing the images I love laid out on the tables, and connecting with friends. This is the first year in a long, long time that I’ve not been present for this festivity. Fortunately, though, Dave keeps me posted by text. It helps bring my memories to life. Finding Reuben Fletcher’s sketch on line from the 2007 party also rekindled memories. I have to admit that I got slightly teary eyed when the first of Dave’s photos rolled in! Glen, Marshall, Dave, and our friends Jamie and Mark Lewis are all going to the Christmas Parade of Boats down the York River this weekend, and I’ll miss that, too. Fond memories of people and places close to my heart…. Glen McClure’s annual holiday print sale, ready for visitors. Dave Chance and Marshall McClure sending holiday cheer. The lovely Marshall McClure to the far left, and Glen McClure to the far right. Views so far today, November 30. These little maps just blow my mind. Can you believe that people in Lithuania, Hong Kong, and Holland visited this blog in the past two days? And how did I get 32 visits from the UK today? The Internet is amazing. I hope I’ve passed on a bit of knowledge, inspiration, and cultural understanding. Views from yesterday, November 29. Simon McGuinness asked me to speak about LEED with his Architectural Technology class. 65% of Ireland’s architects are unemployed today. Shocking. And sad. Today, I got to speak to a room-full of these architects and architectural technologists. They come to DIT once a week — from all over Ireland — to learn about sustainability. To be eligible to take this course, a person has to be receiving some form of unemployment assistance. The government funds this program as a way to infuse knowledge about green building into the community and help re-train this group so they can help address pressing social needs. And what a fantastic audience! I was so caught up in the dialogue that I forgot to take a picture for you. I believe everyone in the room was older than me and likely had much more field experience. And they were fully engaged, interested, and attentive! Full of energy and questions! The teacher of the course, Simon McGuinness, had asked me talk about the nuts and bolts of documenting projects using the LEED Green Building rating system. That can be a very dry subject. But they took it in with enthusiasm. I described the system and how universities and K-12 schools use it. I got to share recommendations from the paper I just published in Planning for Higher Education…. …these are conclusions I drew from my dissertation study. I was shocked to find what a motivating factor the point totals were among the 446 universities buildings that earnd ratings prior to 2010. I was impressed that the USGBC (which runs the LEED program) has been studying the performance of buildings and of its LEED system and making adjustments over time. They’ve upped the ante in the categories of Sustainable Sites, Water Efficiency, and Energy and Atmosphere. Here’s an example of how the USGBC is bringing greater attention to site design (by offering more points in critical areas). I found that the category of Energy and Atmosphere was the #1 predictor of LEED rating among the 181 university buildings in my sample. Dave has made a lot of progress installing a new floor for our porch back home. What a wonderful gift it will be to return to this at Christmas! This is the most recent phase in our very extended porch renovation project. Previously, Dave installed a new foundation and then hired bricklayers to install an entirely new brick foundation and new brick pillars. He placed new limestone steps and limestone caps for the piers. Then he framed in a new structural system for the porch floor, and primed, painted, and installed the tongue-and-groove floorboards. Much earlier in the renovation process, we replaced the dilapidated front door with one we bought at Caravati’s Architectural Salvage in Richmond. It got a new limestone threshold. And someday, we may actually install a window in the transom opening. The green wood siding and the yellow wood columns are original. At this point, they need quite a bit of scraping and painting. I was in charge of the scraping the first time and I did much of the painting as well. This go around should be much easier. The last time we had 100 years worth of paint to remove! Under the porch roof, we found a piece of lumber signed by the builder and dated 1896. That’s quite old for a house in the USA. I noticed this cubist-inspired building facade this morning, while walking down Liffey Street in Dublin. After the dazzling sunrise Thursday morning, a covering of clouds had rolled in. This cover suspended the melting process, extending the pre-dawn frost into the morning. I was scurrying along en route to an all-day seminar. The topics being covered (leadership and change) are central to the paper I’m writing at the moment. So I’d signed up to attend this event hosted by DIT’s Learning, Teaching, and Technology Centre to see how Irish folks talk about the topic and frame the issues. On this particular morning the sidewalks — which the Irish refer to as footpaths — were still slick. A thin layer of frozen mist remained. This distracted me from capturing images for the first few blocks of my walk. It wasn’t too long, however, before a facade that I’d never-before noticed captured my gaze. I dug around for my camera and started to compose. I was eager to show you this built example of cubism. The Cublist Museum in Prague, a built example of cubist. The building is known as the House of the Black Madonna. Photo downloaded from Radio Prague website. I speak from experience when I say that the sky in Prague is often chilly. I visited with a group of Hampton University students one chilly week in March several years ago. Here in Dublin on this particular morning, the lights on this facade brought the building to life. The cubist facade glowed warmly against the steel-grey sky. The chilly sky actually helped me to see something I’d overlooked many times before. Reflection of skyline in the Liffey River. Here’s a photo of this morning’s amazing Dublin sky. The sky is this beautiful nearly every day! Meeting with Brian Bowe and Gavin Duffy at the Beatty Library’s cafe. 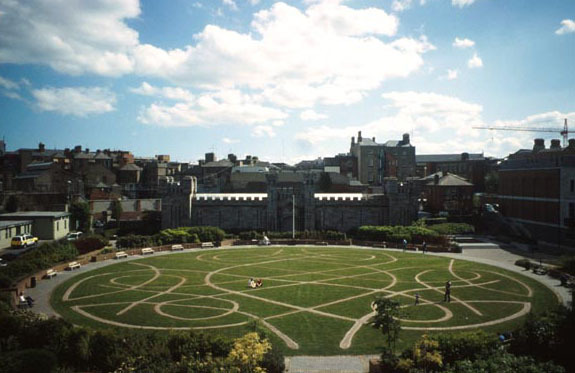 The cafe at the Chester Beatty Library serves up a fine selection of Middle Eastern, North African, Mediterranean, and vegetarian entrees and gluten-free desserts. We met there for lunch Tuesday since it’s halfway between Gavin’s base on Kevin Street and ours on Bolton Street. Mom and her neighbors (Tim and Mary) spoke highly of this “Silk Road Cafe.” The Dean had heard its praises sung as well. Unfortunately, he was called to a more urgent meeting and couldn’t join us after all. The Beatty Library’s sun-filled, glass-covered courtyard was a lovely setting for our discussion of student-centered learning, research, and publication strategy. Although I didn’t get Gavin and Brian into the actual exhibit halls, at least they got to experience the covered courtyard and the stunning “Castle garden.” It’s surrounded by a high wall and feels very much like a secret garden. During my childhood, I dearly loved the book The Secret Garden. A few hours after our lunch, I had another brush with great museums when Seán Rainbird lectured at the DIT School of Architecture. He’s the new director of the National Gallery of Ireland. He has also worked at the Tate in London and the Stattsgallerie in Stuttgart (designed by James Stirling’s office). 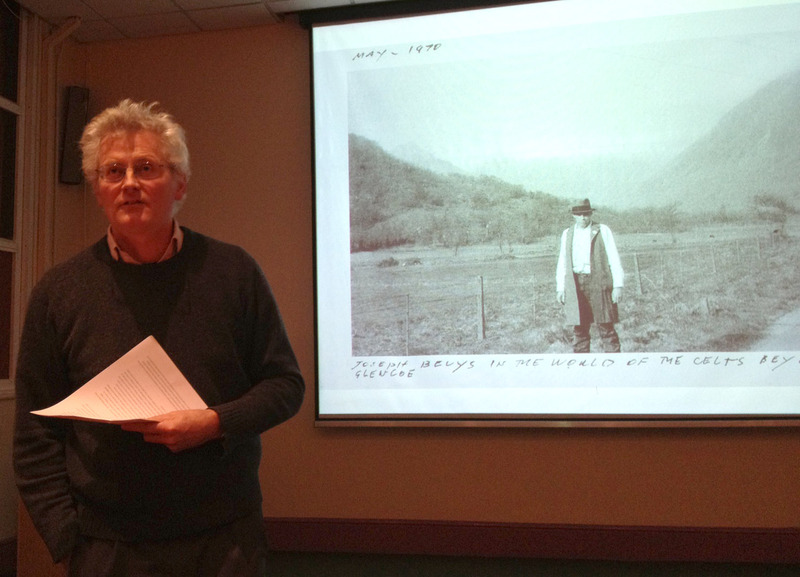 Seán Rainbird talked about Joseph Beuys’ fascination with all things Celtic when he spoke at the DIT School of Architecture. Can you imaging that I delivered a lecture in the same “Schools of Thought” lecture series with such an accomplished person? Wow! Seán talked about Joseph Beuys and the Celtic World, the topic of a book he wrote. He said he had just three weeks to write it! Can you imagine being so knowledgeable about a topic that you could produce a press-worthy document in just three weeks? Truly amazing. They say everyone wants to “be like Mike.” I’d rather “be like Seán” myself! Thanks, Chris Bonney, for forwarding this article to me.